Don’t you wish you could have a list of recipes that you can whip up in a few minutes, use only a pot or two and require only a bit of time in the kitchen?? All of us lead super busy lives and we go about the daily motions wishing there will be more hours in the day. And then comes meal time! You want to feed your family something wholesome, but at the end of the day, just the thought of making something well balanced seems arduous! But what if you could make something in just about half hour and feel good knowing you are feeding the family a delicious and nutritious meal! This dish is one of those accidental happenings in the kitchen tonight! 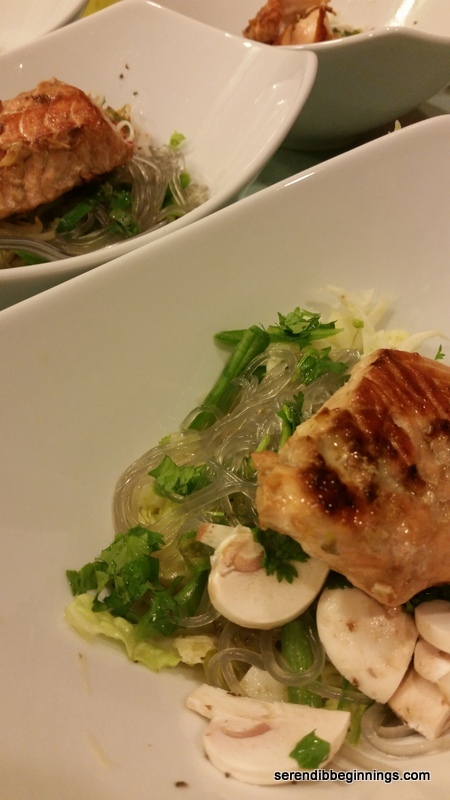 Inspiration for this dish comes from a delicious serving of pho noodle soup I had last week. I loved the delicately seasoned simple but delectable broth, crunchiness of the fresh veggies and the soft, chewiness of rice noodles. 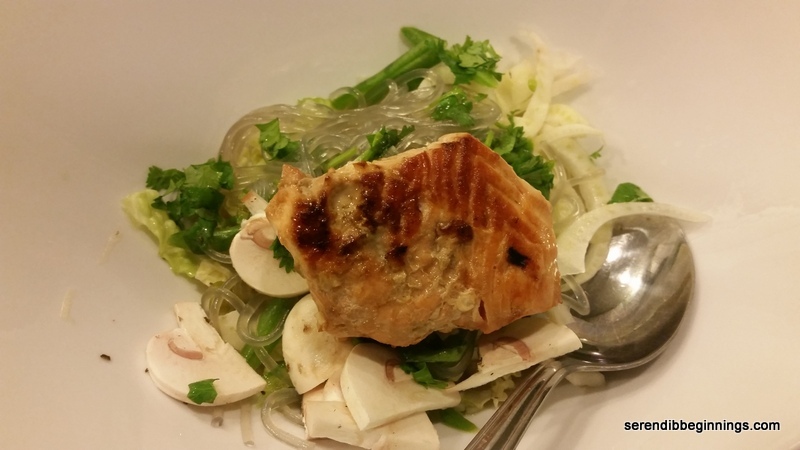 So, I thought of making something similar with the ingredients I had in the kitchen – glass noodles, fennel bulb, savoy cabbage, green beans, salmon and cilantro. 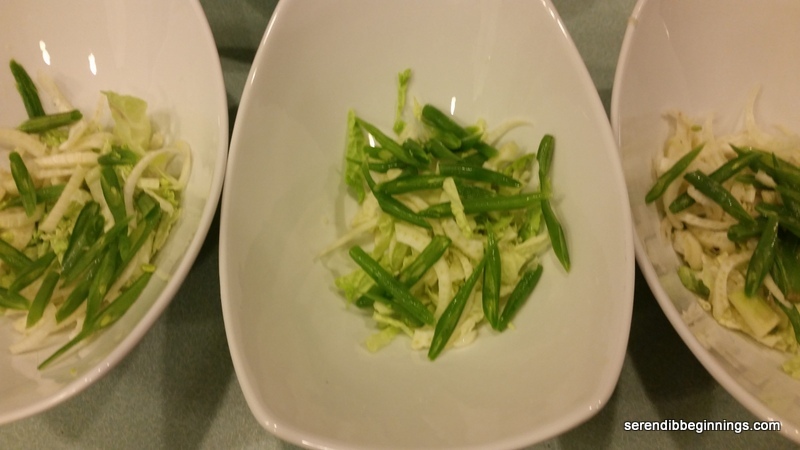 Once you clean and slice the vegetables, it is a snap to put this dish together. 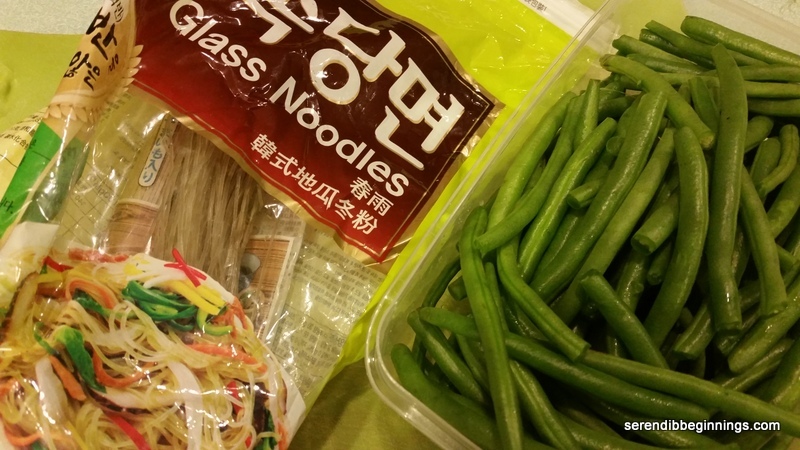 To have a good flow….I will recommend starting with a pot of water to boil the noodles. Next, you should marinate the salmon in a mixture of soy sauce, ginger and garlic. 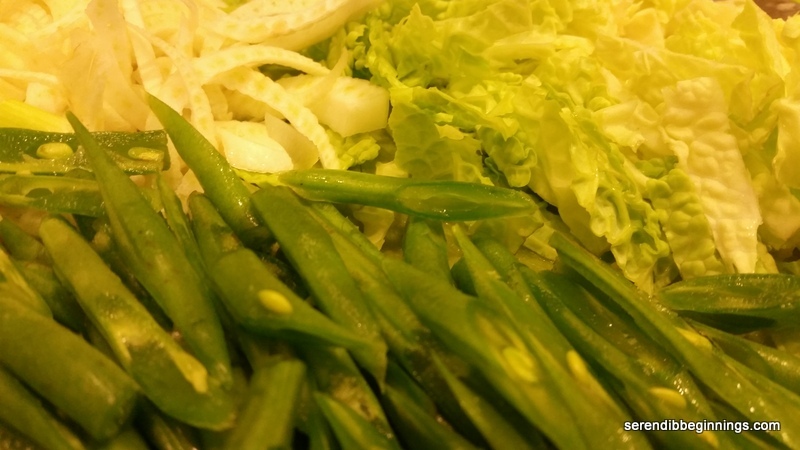 While the fish is marinating, clean, wash and slice the vegetables. Now, you can add the noodles to the water, heat a pan to saute the fish and distribute the vegetables in four serving bowls. Then, you will be left with just heating the broth with a few seasonings and pouring it over the vegetables and noodles and topping off with a piece of salmon. Yum! 1. 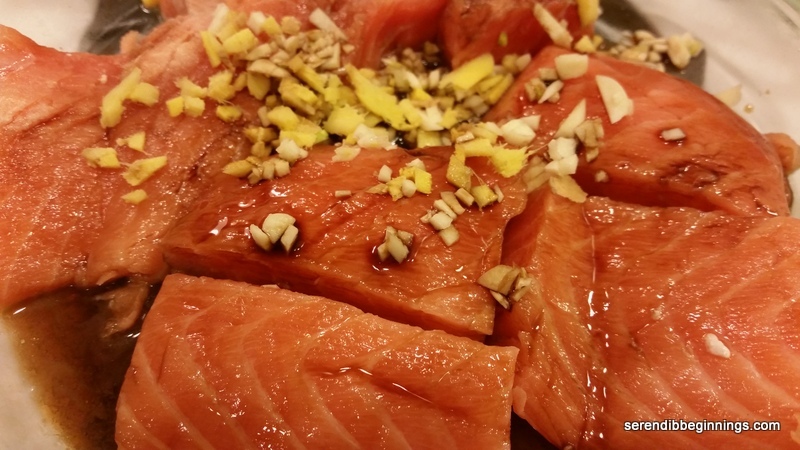 Begin by marinating the salmon in a mixture of soy sauce, ginger and garlic. 2. Place a pot of water to boil; Cook noodles according to instructions. 3. Drain the noodles and keep aside and return the pot back to stove top. 4. Empty the can of broth into the pan and bring to a boil with a teaspoon of soy sauce, sesame oil, lime juice and basil. 5. Clean and prepare all the vegetable as listed above. 6. Distribute the veggies among 4 serving bowls. 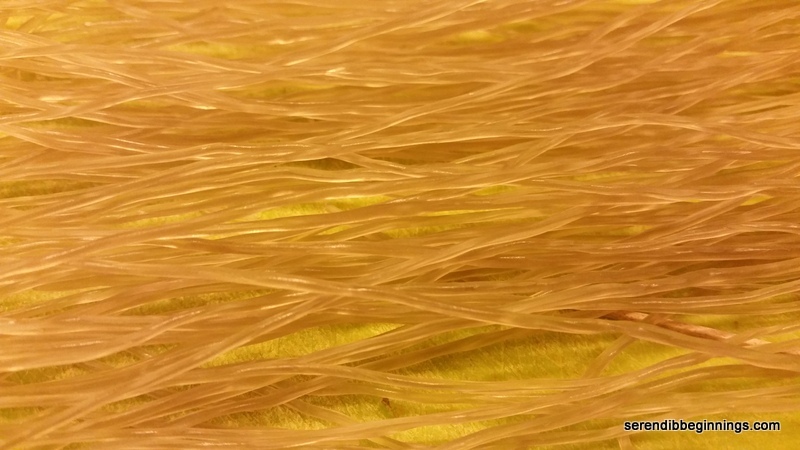 Top with cooked noodles. 7. Heat a frying pan over medium high heat and spray with cooking spray. Cook salmon until done. 8. Add hot broth to the vegetables and top with salmon. Sprinkle additional cilantro if desired and top with a squeeze of fresh lime juice and crushed red peppers, if desired. So, back to what has been consuming my free moments! Very special Sweet 16! 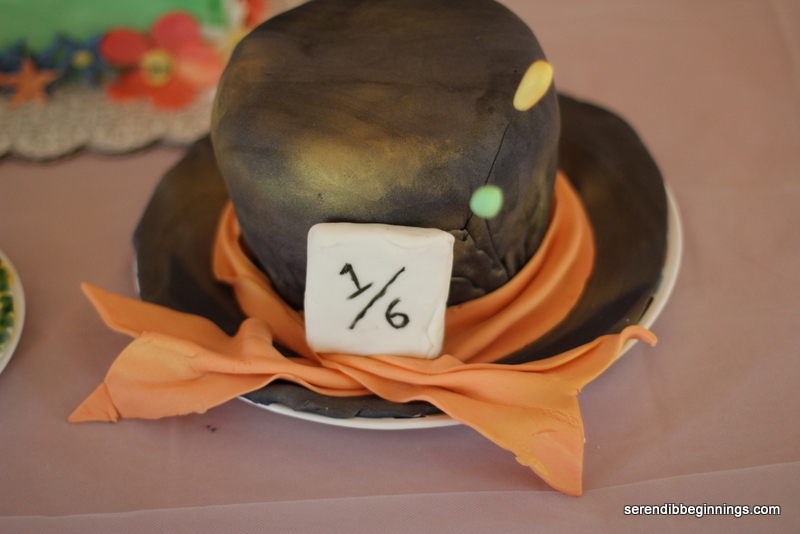 Wait, not just any sweet 16, Alice in Wonderland themed Sweet 16! My primary focus was to make a very special cake and other treats that will “speak” the theme without not so much as saying a word! 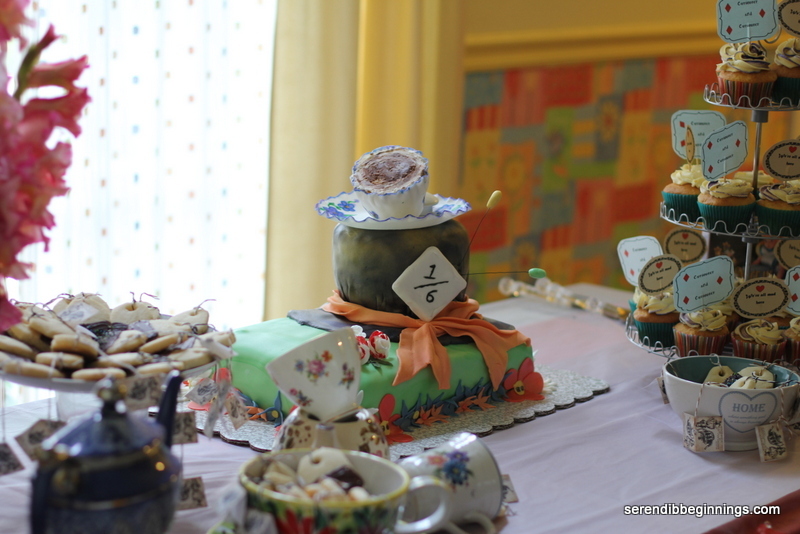 But then again, I wouldn’t have been surprised if the cake spoke – after all, all sorts of things speak in that tale! So, I started imaging and dreaming up the design. Should it be topsy turvy? How about a spell-casting magical mushroom? How about Alice diving into Rabbit Hole? I know, I will just pull in little bit of this and little bit of that and that’s what I did. 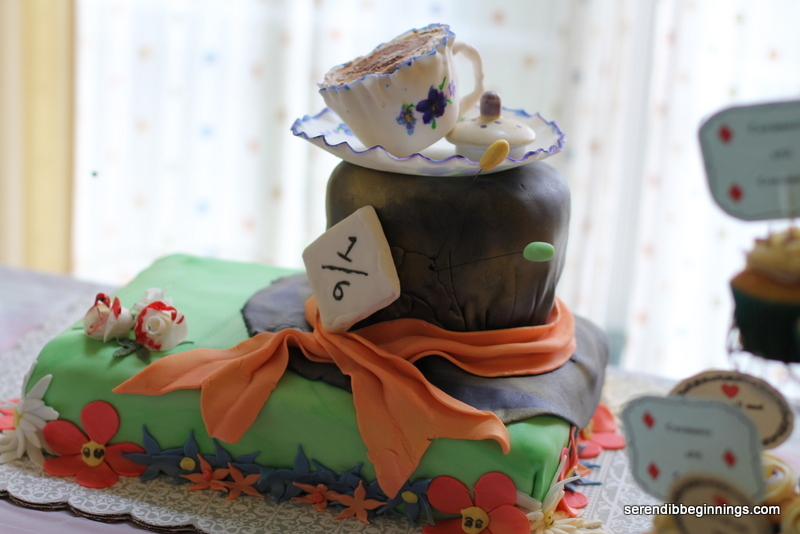 I decided to make a multi-layered cake – starting with a green base to imply forest floor, anchor it with a large mad hatter hat and top it with a whimsical cute china tea cup and saucer. Yes! That will be it! Now, on to making it a reality! 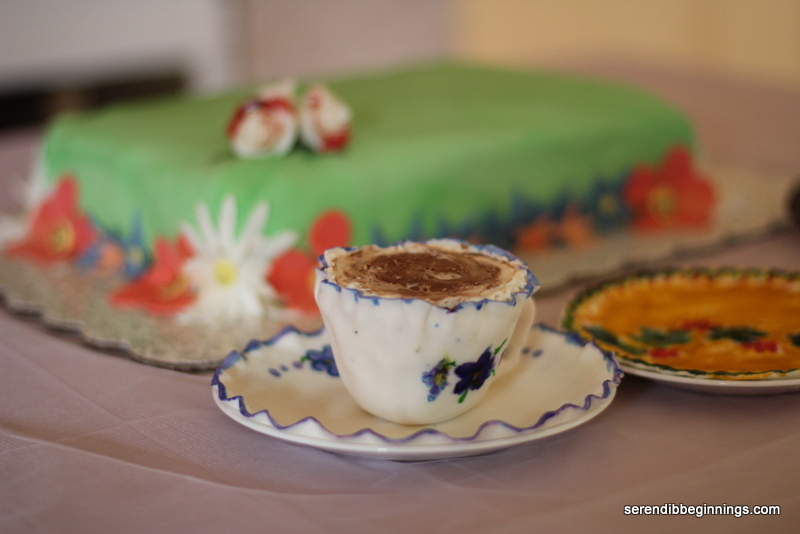 You see, I am not a fan of fondant at all! I mean, you would have to really give me a compelling reason to resort to fondant. I always prefer the creamy deliciousness of buttercream! 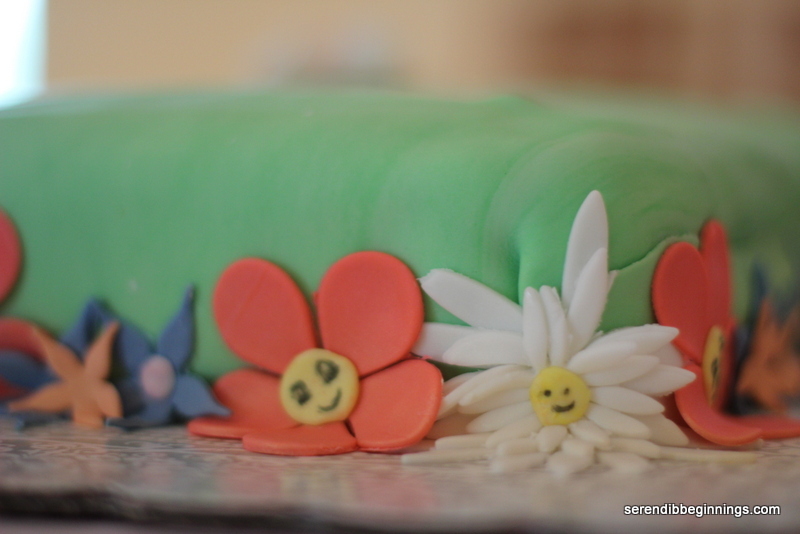 But, I decided fondant will be a must-have for making this cake design a decent reality. So, I caved! What about the cakes? I usually go with a good quality box mix and make homemade frosting and filling. It’s after all icing on the cake that everyone loves right! But in order to make sure the bottom layer will hold up to the top layers and hold the weight of fondant without succumbing to all the weight, I knew I had to go with a sturdy cake like a pound cake. So, I made three different flavors – regular pound for the bottom, grapefruit flavor for the hat and lemon-coconut for the tea cup (and cup cakes). You need to plan ahead to make it a bit easier on you to make, assemble and decorate the cake. 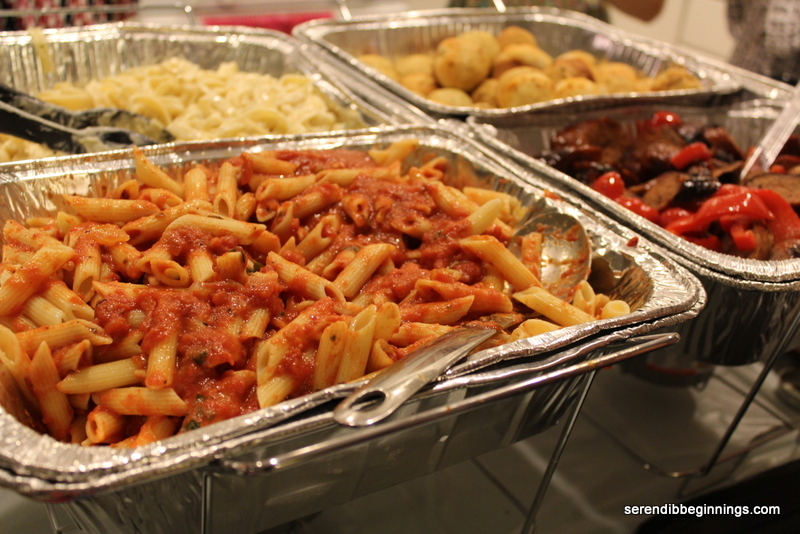 I made the sauce few days before the party so they could dry a bit. Also, stack the cakes just before party time. Lastly, humidity is an enemy for fondant. So, take precautions to minimize any disappointment! Last time I worked with fondant to make a “tardis” cake, I was horrified to find “tardis” kind of sinking to one side because the fondant was loosening up a bit with the high humidity. My ultimate reward was when the birthday girl was completely awe-struck with the cake and so were so were here friends! Was this truly the best I could make? Perhaps not! But was it my best effort at that moment? Of course yes! I also made other treats to remind of the theme! I made shortbread cookies that looked like tea bags. They were so cute. I found the image for the perfect tag! 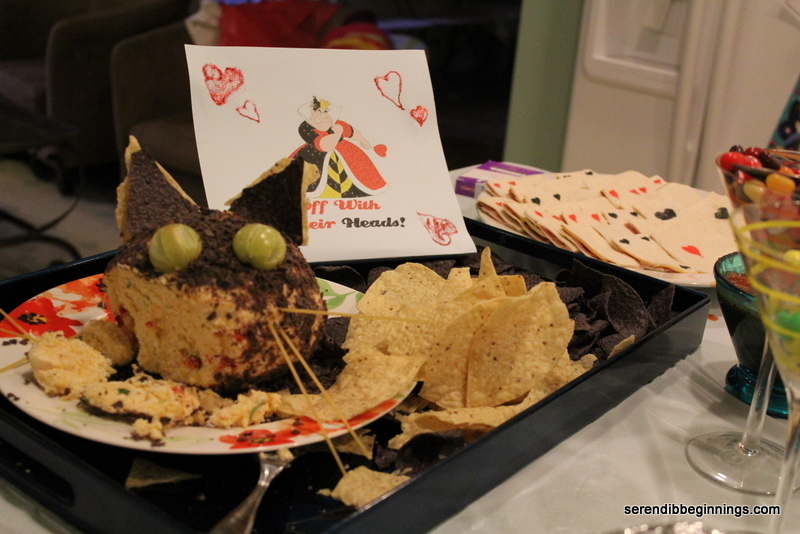 Needless to say, these little creations were such a huge hit. In addition, I made cupcakes and mini pink lemon mousse in clear shot glasses! 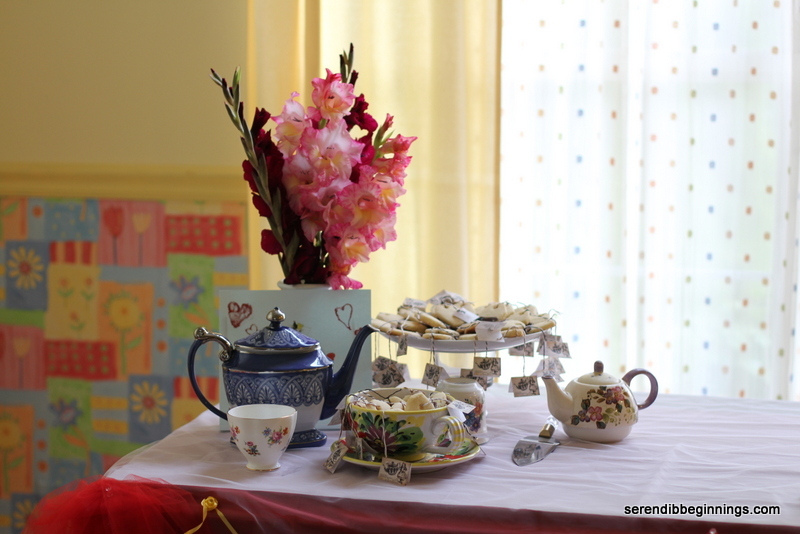 The table was set with English tea cups and teapots sourced from antique markets and thrift stores to create the tea party scene. 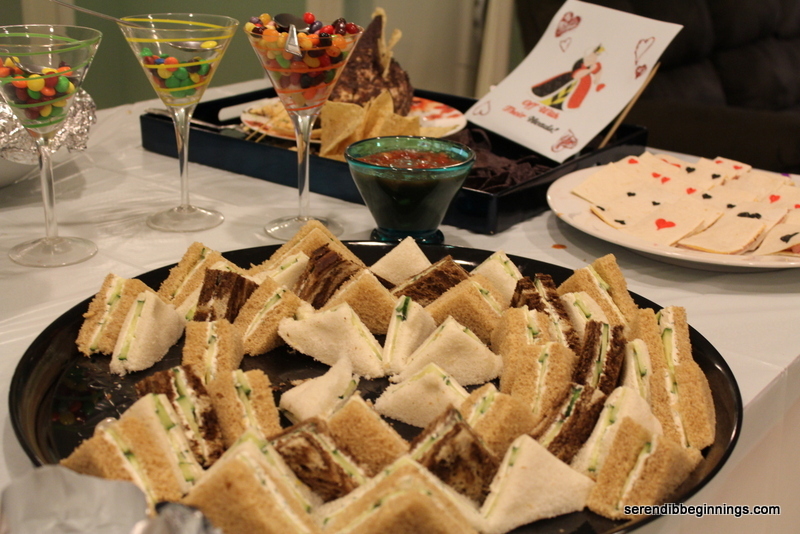 All-in-all, after weeks of stressing about it, I think the party and the food were great success! I hope you will have an opportunity to try out this theme sometime! It was a hit with the teenagers, especially because they got to dress up for the party as well!